This book highlights what is wonderful about the Episcopal Church. 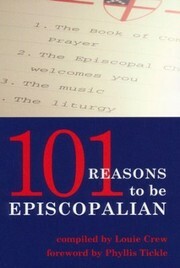 101 reasons to be Episcopalian / compiled by Louie Crew. $c Statement of responsibility compiled by Louie Crew. 300 Physical Desc $a Extent 101 p.
520 Summary $a Summary, etc. note This book highlights what is wonderful about the Episcopal Church.